This is a winamp skin I made years ago, that I have archived here since it's mine and I don't want to risk losing it if/when winamp.com goes down. 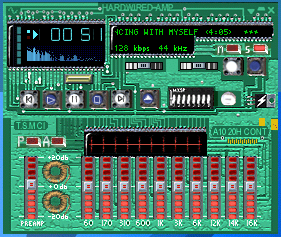 Being a standard winamp2 skin, it also works fine in XMMS©. Not the best thing ever, but it took an awful lot of work, and I think it's not bad for someone's very first attempt at skin creation.